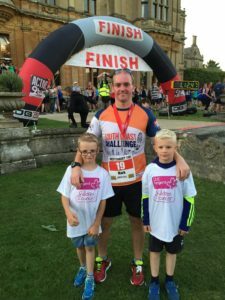 I ran the Westonbirt 10K as part of my training plans before I take on The Great South Coast Challenge 100k in 24hrs. We are raising funds for CLIC Sargent after the help they gave us when my son, Tristan was diagnosed with cancer back in 2007. Now 9 years on Tristan has been given the all clear so what better way to celebrate. It all started back in November 2007 when our 9-week old son was diagnosed with a cancer called neuroblastoma. Unfortunately, he had complications and had to undergo chemo and spend time in intensive care in John Radcliffe hospital Oxford. After his first lot of chemo he suffered another setback by getting an infection which resulted in him having to stop chemo, after a few days of treating the infection things started to begin to turn in our favour and he began to recover and his body started to fight the cancer and slowly break it down. A few days before Christmas after being taught how to care for Tristan at home they allowed us to take him home for his first Christmas and every day he got stronger and stronger. At the age of 9, we have been given that fantastic news that he has been cleared and signed off their books and will no longer need to be seen. While going through all of this from the beginning CLIC were there from day one with visits from their team for a chat to financial support if needed and just there in general for our son and just as much for us. I want this to be the thank you they deserve and what better way than to raise as much as possible to support this wonderful charity and enable them to do what they do best and continue to help families in the future.